Scylla became acutely ill 15 August 2013, it happened very fast, one minute she was happy and well and the next she was in a really bad shape. Despite antibiotics and fluid she did not get better and at the vets the next day (16 August) there was nothing more to do – Scylla passed away in my arms. She died of a pyometra. I had already decided that if she got a pyometra she would not go into surgery – Scylla had never had surgery before and had never been admitted to a animal hospital and I didn’t want her to go through that at her age. Scylla was 11.5 years and happy and well up til the last days. RIP my darling little Scylla! Scylla was a female that I borrowed for breeding, she moved in with us in spring 2007 and stayed for the rest of her life! Scylla was the mother of Silogården’s first litter, the D litter that was born 3 February 2008 here in Hjortkvarn, she is also the mother of the E’W litter born 16 June 2009, her last litter. Read more about the litters on each litter page. Scylla’s puppies have inherited her stable mentality, something I am very happy for! In her first litter (the D litter) she has produced very good hips, out of 9 puppies 8 have been x-rayed, all with A/A and normal elbows! Also her last litter, the E’W, has fantastic results; 9 out of 10 are x-rayed and all have perfect hips and elbows! Scylla had her first litter in August 2006, 9 lovely puppies were born, they gained weight and were healthy until 7 days old. Then the first puppy died and after 2 days all the 9 puppies had died. I sent 2 of them to autopsy and found out that they had died of the Herpes virus. Herpes virus is very common in dogs, around 70-80% of all dogs have or have had Herpes and there is no danger for adult dogs, but it is lethal for newborn puppies. If you keep the environment really warm around the puppies the virus won’t break out. Scylla was from the same litter as my Silo. Scylla was raised together with 15 Great Pyrenees Dogs, 2 NSDTR, 200 sheep and 3 horses! She was purchased for herding the sheep and she has been a great help. Unfortunately she was a little bit too fond of chasing them…. Scylla was never trained for obedience or tracking, but I did some work with her and she loved it! When Scylla moved in with us she didn’t dare play with toys or play tug with me. The NSDTRs in her first home had attacked her too often when she wanted to play with the ball, so she decided not to play. BUT it didn’t take long for her to begin playing with my crazy dogs and after that it was Scylla who often was the first to catch the ball and run with it. And she tugged really good…. one had to watch ones fingers! It was lovely to see her play and there was a LOT of dog behind her calm facade. 🙂 THAT is clearly visible in her puppies! 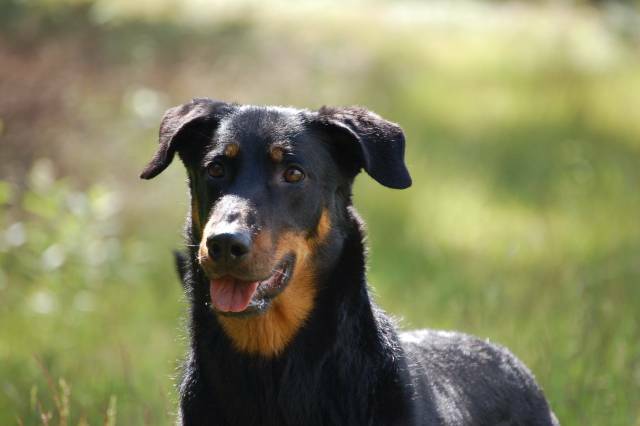 Scylla was, as her brother Silo, a very calm, friendly and social dog that got along with what ever you asked of her. Scylla wanted to participate and she could come along almost everywhere. If nothing happened she would lay down and relax, if we went for a walk she would give 100%!